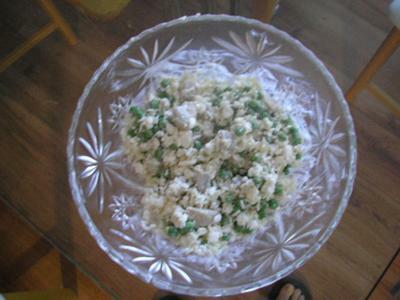 I came up with this recipe after my dog suffered bloat from eating just kibble. We still supplement the diet with some kibble to insure our dogs get all the nutrients they need. 1 to 1 1/2 boneless, skinless, chicken thighs or if you prefer you can use chicken breasts. Mix in the remaining 3 ingredients and serve. Our dogs can't get enough of this recipe. PLEASE MAKE SURE YOUR DOG DOESN'T HAVE A SENSITIVITY TO ANY OF THE INGREDIENTS IN THIS RECIPE.